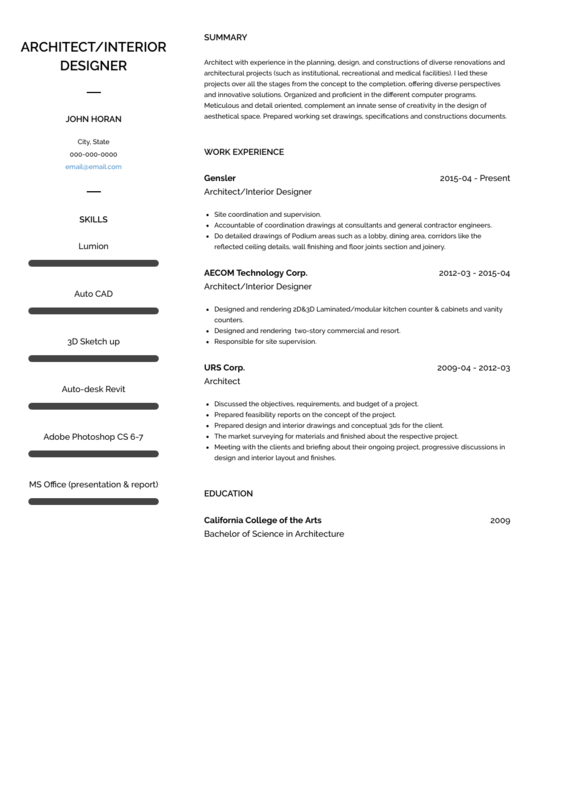 This page provides you with Interior Designer resume samples that you can use for inspiration in writing your own resume, or for creating one through our easy-to-use resume builder. Below you'll find our how-to section that will guide you through each section of a Interior designer resume. As an Interior Designer, you are passionate about making the interior and the environment of any building look aesthetically more pleasing for the people using that space. You are, after all, a project manager in the Interior Design industry, as your responsibilities go from planning and researching to coordinating and implementing those projects. You have an innate flair for architecture, fabrics, textiles and color. You are a successful professional that probably think you should have the best Interior Design resume, but have little or no idea on where to start. Well, you’ve finally reached your destination: VisualCV has helped thousands of professionals in the Interior Design industry get the job they have always dreamt of and we want the same for you. Let us help you build the best resume ever, thanks to excellent Interior Designer resume sample accessible for you, at any given time. Did you know that most resumes don’t get more attention than 15 seconds? Crafting a strong interior designer resume is not only important, it is fundamental! As per the format, the reverse-chronological layout will be your best option, in order to introduce the recruiter and your future hiring manager to your most recent best achievements as soon as they start reading your resume. Use friendly tones: they are far better than a simple fact-to-fact style as it can often be off-putting. You are a professional and you need the recruiter to understand that. The type of fonts used must also fit the style you’re aiming for: use clear, powerful fonts. Unfortunately there are some fonts which are difficult to read and that’s off-putting. Instead, a basic font can be more impressive than one which is impossible to understand. It’s the same with the colors used in the resume. You are an interior designer and, while using a couple of colors to highlight the more important elements can appear to be a good decision, make sure you don’t exaggerate! Your future employer can think it’s a bit childish to have a rainbow of color on your resume. Check the grammar before you send your resume away and save it as a .pdf: Microsoft Word is not a big fan of Fashion Designer resumes! The competition in fashion is so high that you need to stand out from the crowd: think of this section as if you had 60 seconds to pitch the recruiter and after that you’d be either onto the next section or out of the door. Showcase your best achievements and be succinct and precise! Summarize your past 5 years. Say you will be the “best Fashion Designer” more than once. Answer this question before digging into this section: “What work experience can you list to get the recruiter interested and to ensure you don’t get forgotten amongst the pile of resumes they have received”? What has been your best achievement? Who was your best client? Were you involved in any work that has been published on famous Interior Design magazines? As soon as you have answered these questions, all you have to do is just use bullet points and include them all in your work history! Always discuss your best wins of your internship. Don’t stretch this section for too long. Education is fundamental in an Interior Designer resume: if you have attended college or have earned an associate degree in Interior Design, please include them as it will show your knowledge of theory, techniques and art/fashion history. Don’t stop here: Make sure you list any certification or additional training you have undertaken. Even internships are very important as long as you can list what you have learnt from them! This is a very important section for a Fashion Designer resume as client’s are searching for specific skills that their hire must have to complete the job. You must be aware that recruiters will probably be looking for certain keywords and you want to make sure you list them in this section of your resume.